As you get older, the tissue forming the lens grows less flexible, thicker, and less transparent. As light passes through the lens, these cloudy areas scatter the rays and cause blurred vision. Many people report that having cataracts is like looking through a foggy windshield, as everything looks clouded. This can cause difficulties when driving, reading, and performing other everyday activities. In their early stages, cataracts may cause only minor visual impairment. Using brighter lights for reading or getting an anti-glare coating on your glasses for night driving may be adequate treatments in the early stages. 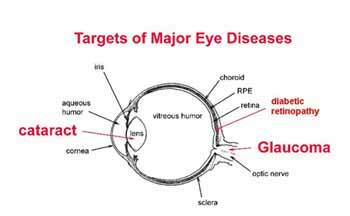 As cataracts grow, however, they can severely impair vision. Your doctor may recommend cataract surgery, in which the clouded lens is removed and replaced with an artificial lens. Cataract surgery is considered a very safe surgery that is routinely performed across the United States. Clouded vision due to cataracts can be very impairing, so it is important to monitor your eye health. An annual eye exam will detect changes to your lens that may be early indicators of cataract development.